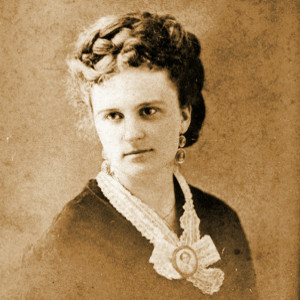 American author Kate Chopin (1850–1904) wrote two published novels and about a hundred short stories in the 1890s. Most of her fiction is set in Louisiana and most of her best-known work focuses on the lives of sensitive, intelligent women. Her short stories were well received in her own time and were published by some of America’s most prestigious magazines—Vogue, the Atlantic Monthly, Harper’s Young People, Youth’s Companion, and the Century. A few stories were syndicated by the American Press Association. Her stories appeared also in her two published collections, Bayou Folk (1894) and A Night in Acadie (1897), both of which received good reviews from critics across the country. Twenty-six of her stories are children’s stories—those published in or submitted to children’s magazines or those similar in subject or theme to those that were. By the late 1890s Kate Chopin was well known among American readers of magazine fiction. Her early novel At Fault (1890) had not been much noticed by the public, but The Awakening (1899) was widely condemned. Critics called it morbid, vulgar, and disagreeable. Willa Cather, who would become a well known twentieth-century American author, labeled it trite and sordid. Some modern scholars have written that the novel was banned at Chopin’s hometown library in St. Louis, but this claim has not been able to be verified, although in 1902, the Evanston, Illinois, Public Library removed The Awakening from its open shelves—and the book has been challenged twice in recent years. Chopin’s third collection of stories, to have been called A Vocation and a Voice, was for unknown reasons cancelled by the publisher and did not appear as a separate volume until 1991. Chopin’s novels were mostly forgotten after her death in 1904, but several of her short stories appeared in an anthology within five years after her death, others were reprinted over the years, and slowly people again came to read her. In the 1930s a Chopin biography appeared which spoke well of her short fiction but dismissed The Awakening as unfortunate. However, by the 1950s scholars and others recognized that the novel is an insightful and moving work of fiction. Such readers set in motion a Kate Chopin revival, one of the more remarkable literary revivals in the United States. After 1969, when Per Seyersted’s biography, one sympathetic to The Awakening, was published, along with Seyersted’s edition of her complete works, Kate Chopin became known throughout the world. She has attracted great attention from scholars and students, and her work has been translated into other languages, including Albanian, Arabic, Chinese, Czech, Danish, Dutch, French, Galician, German, Hungarian, Italian, Japanese, Korean, Malayalam, Polish, Portuguese, Serbian, Spanish, Swedish, Turkish, and Vietnamese. (If you know of a translation into another language, would you write to us?) She is today understood as a classic writer who speaks eloquently to contemporary concerns. The Awakening, “The Storm,” “The Story of an Hour,” “Désirée’s Baby,” “A Pair of Silk Stockings,” “A Respectable Woman,” “Athénaïse,” and other stories appear in countless editions and are embraced by people for their sensitive, graceful, poetic depictions of women’s lives. Catherine (Kate) O’Flaherty was born in St. Louis, Missouri, USA, on February 8, 1850, the second child of Thomas O’Flaherty of County Galway, Ireland, and Eliza Faris of St. Louis. Kate’s family on her mother’s side was of French extraction, and Kate grew up speaking both French and English. She was bilingual and bicultural–feeling at home in different communities with quite different values–and the influence of French life and literature on her thinking is noticeable throughout her fiction. From 1855 to 1868 Kate attended the St. Louis Academy of the Sacred Heart, with one year at the Academy of the Visitation. As a girl, she was mentored by woman–by her mother, her grandmother, and her great grandmother, as well as by the Sacred Heart nuns. Kate formed deep bonds with her family members, with the sisters who taught her at school, and with her life-long friend Kitty Garasché. Much of the fiction Kate wrote as an adult draws on the nurturing she received from women as she was growing up. Her early life had a great deal of trauma. In 1855, her father was killed in a railroad accident. In 1863 her beloved French-speaking great grandmother died. Kate spent the Civil War in St. Louis, a city where residents supported both the Union and the Confederacy and where her family had slaves in the house. Her half brother enlisted in the Confederate army, was captured by Union forces, and died of typhoid fever. At eighteen, Kate was an “Irish Beauty,” her friend Kitty later said, with “a droll gift of mimicry” and a passion for music. At about nineteen, through social events held at Oakland, a wealthy estate near St. Louis, Kate met Oscar Chopin of Natchitoches Parish, Louisiana, whose French father had taken the family to Europe during the Civil War. “I am going to be married,” Kate confided in her commonplace book, “married to the right man. It does not seem strange as I had thought it would–I feel perfectly calm, perfectly collected. And how surprised everyone was, for I had kept it so secret!” Kate and Oscar were married in 1870. The Chopins toured Germany, Switzerland, and France. They saw Paris only briefly, in September, 1870, during the Franco-Prussian War, at a moment when the city was preparing for a long siege. Kate never visited Europe again. Back in the States, the couple settled in New Orleans, where Oscar established a business as a cotton factor, dealing with cotton and other commodities (corn, sugar, and molasses, among them). 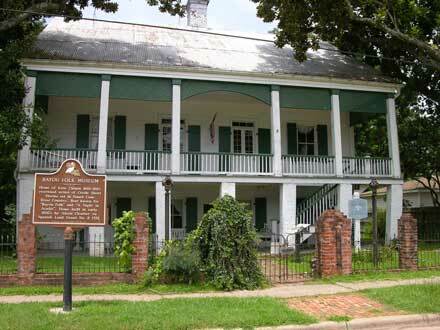 Louisiana was in the midst of Reconstruction at the time, and the city was beset with economic and racial troubles. Oscar joined the notorious White League, a Democratic group that in 1874 had a violent confrontation with Republican Radicals, causing President Grant to send in federal troops. But New Orleans also offered superb music at the French Opera House, along with fine theatre, horse races, and, of course, Mardi Gras. Kate may have met the French painter Edgar Degas, who lived in New Orleans for several months around 1872. She would have been observing life in the city, gathering material that she could draw upon for her fiction later in life. Like other wealthy families in the city, the Chopins would go by boat to vacation on Grand Isle, a Creole resort in the Gulf of Mexico. Between 1871 and 1879 Kate gave birth to five sons and a daughter–in order of birth, Jean Baptiste, Oscar Charles, George Francis, Frederick, Felix Andrew, and Lélia (baptized Marie Laïza). Oscar bought a general store in Cloutierville, but in 1882 he died of malaria–and Kate became a widow at age thirty-two, with the responsibility of raising six children. She never remarried. In 1883 and 1884, Chopin’s recent biographer, Emily Toth, has written, Kate had an affair with a local planter. But she then moved with her family back to St. Louis where she found better schools for her children and a richer cultural life for herself. Shortly after, in 1885, her mother died. Kate Chopin’s home was at 4232 McPherson Avenue in St Louis; it is still lived in today. Dr. Frederick Kolbenheyer, her obstetrician and a family friend, encouraged her to write. Influenced by Guy de Maupassant and other writers, French and American, Kate began to compose fiction, and in 1889 one of her stories appeared in the St. Louis Post Dispatch. In 1890 her first novel, At Fault, was published privately. The book is about a thirtyish Catholic widow in love with a divorced man. Like Edna Pontellier in The Awakening, Thérèse Lafirme struggles to reconcile her “outward existence” with her “inward life.” She cannot as a practicing Catholic accept the idea of divorce, yet she cannot banish from her life the man whom she loves. At Fault offers a compelling glimpse into what Kate Chopin was thinking about as she began her writing career. Chopin completed a second novel, to have been called Young Dr. Gosse and Théo, but her attempt to find a publisher failed and she later destroyed the manuscript. She became active in St. Louis literary and cultural circles, discussing the works of many writers, including Georg Wilhelm Friedrich Hegel, Émile Zola, and George Sand (she had called her daughter Lélia, apparently after the title of Sand’s 1833 novel). During the next decade, although maintaining an active social life, she plunged into her work and kept accurate records of when she wrote her hundred or so short stories, which magazines she submitted them to, when they were accepted (or rejected) and published, and how much she was paid for them. In 1889 she wrote “A Point at Issue!” and in 1891 rewrote “A No-Account Creole” (which she had originally written in 1888) and wrote the children’s story “Beyond the Bayou” and other stories. Five of her stories appeared in regional and national magazines, including Youth’s Companion and Harper’s Young People. She wrote “Désirée’s Baby” and the little sketch “Ripe Figs” in 1892. “At the ‘Cadian Ball” appeared in Two Tales that year, and eight of her other stories were published. The next year she wrote “Madame Célestin’s Divorce,” and thirteen of her stories were published. Chopin traveled to New York and Boston to seek a publisher for a novel and a collection of stories. In 1894 she wrote “Lilacs” and “Her Letters.” “The Story of an Hour” and “A Respectable Woman” appeared in Vogue. And Houghton Mifflin published Bayou Folk, a collection of twenty-three of Chopin’s stories. Bayou Folk was a success. Chopin wrote that she had seen a hundred press notices about it. The collection was written up in the New York Times and the Atlantic, among other places, and most reviewers found its stories pleasant and charming. They liked its use of local dialects. Her 1894 comment about the importance of describing “human existence in its subtle, complex, true meaning, stripped of the veil with which ethical and conventional standards have draped it” and her conviction that “truth rests upon a shifting basis and is apt to be kaleidoscopic” are helpful points of reference in approaching Kate Chopin’s work. In 1895 Chopin wrote “Athénaïse” and “Fedora,” and twelve of her stories were published. In 1896 she wrote “A Pair of Silk Stockings.” “Athénaïse” was published in the Atlantic Monthly. In 1897 Way and Williams (of Chicago) published A Night in Acadie, a collection of twenty-one Chopin stories. Like Bayou Folk, her earlier collection, A Night in Acadie was praised by the critics. One reviewer called it “a string of little jewels,” and a modern critic considers it one of America’s great nineteenth-century books of short stories. Chopin’s grandmother, Athénaïse Charleville Faris, died in 1897. Chopin worked on The Awakening that year, finishing the novel in 1898. She also wrote her short story “The Storm” in 1898, but, apparently because of its sexual content, she did not send it out to publishers. Probably no mainstream American publisher would have printed the story. The next year, 1899, one of her stories appeared in the Saturday Evening Post, and Herbert S. Stone published The Awakening. A few critics praised the novel’s artistry, but most were very negative, calling the book “morbid,” “unpleasant,” “unhealthy,” “sordid,” “poison.” You can read about the reviewers in the Chopin biographies listed below, in Margo Culley’s Norton Critical Edition of the novel, and in Janet Beer’s Cambridge Companion to Kate Chopin, among other places. For details, scroll down on The Awakening page of this site. Two of Chopin’s stories were published in Vogue in 1900. You can find out when Kate Chopin wrote each of her short stories and when and where each was first published. Herbert S. Stone, for unknown reasons, canceled her contract for A Vocation and a Voice, a third collection of her stories (the collection was published by Penguin Classics in 1991). In 1902 “A Vocation and a Voice,” the title story of Chopin’s proposed volume, was published in the St. Louis Mirror. In 1904 Kate Chopin bought a season ticket for the famous St. Louis World’s Fair, which was located not far from her home. It had been hot in the city all that summer, and Saturday, August 20, was especially hot, so when Chopin returned home from the fair, she was very tired. She called her son at midnight complaining of a pain in her head. Doctors thought that she had had a cerebral hemorrhage. She lapsed into unconsciousness the next day and died on August 22. She is buried in Calvary Cemetery in St. Louis, where many people visit her gravesite and sometimes leave behind tokens of their affection. Her last published story appeared in Youth’s Companion on March 30, 1905. You can read “Her First Party” as it looked when it appeared. Since 1969, countless scholars have written about Chopin’s life and work. Feminist critics have had an enormous influence. Most of what has been written about Kate Chopin since 1969 is feminist in nature or is focused on women’s positions in society. Sandra Gilbert’s introduction to the Penguin Classics Edition of The Awakening, for example, and Margo Culley’s selection of essays for the Norton Critical Edition of the novel are familiar to a generation of readers, although scholars have also been dealing with other subjects and themes. Lists of critical works appear at the bottom of those pages on this site devoted to Chopin’s two novels and her most popular short stories. Today Kate Chopin is widely accepted as one of America’s essential authors. Her novels and stories are available in countless books and online. Critics and scholars in many countries have discussed her work in over 400 journal articles as well as in at least 60 books and 160 PhD dissertations. Artists have created plays, films, songs, operas, dances, screenplays, graphic fiction, and other art forms based on her work. The Central West End Association of the city of St. Louis, Missouri, in 2012 dedicated a bust of Kate Chopin at the Writers’ Corner in the city. The most recent–and today by far the most influential–biography of Kate Chopin is Emily Toth’s Unveiling Kate Chopin (Jackson: University Press of Mississippi, 1999). Emily Toth earlier published a longer biography, Kate Chopin (New York: Morrow, 1990). An important biography is the one referred to above, Per Seyersted’s Kate Chopin: A Critical Biography (Baton Rouge: Louisiana State University Press, 1969). Q: Does Kate Chopin have any descendants living today? A: Yes, she has many. You can read about some of them on our page, Kate Chopin’s Family Today. Q: I’m reading Harriet Beecher Stowe’s Uncle Tom’s Cabin and I’ve just met Simon Legree. I’ve read somewhere that Simon Legree was modeled after the father of Oscar Chopin, Kate Chopin’s husband. Do you know if this is true or just rumor? So the connection between Oscar Chopin’s father and Simon Legree is rumor, not fact. You may want to read Chopin’s early novel, At Fault. It includes a chapter in which two characters visit Robert McAlpin’s grave. Q: Can anyone help with the identity of Mrs. F. M. Estere of 4434 Laclede Avenue of St. Louis and her possible connection with Kate Chopin?